Believe it or not, the cranberries on your plate this Thursday are pretty much the same as the cranberries served at the very first Thanksgiving dinner. Back then, Pilgrims just reached down and picked them up. But today, cranberry harvesting is serious business. Early Show Correspondent Melinda Murphy headed to New Jersey's Pine Island Cranberry Company, where owner Bill Haines gave her a first-hand lesson. Waders are quite the fashion necessity on the bog, because cranberries are harvested in the water. So Murphy and her crew had to wear the high, waterproof boots. Before getting waist-deep in water, Murphy took a tour of the 150-acre farm. The dams of the land were built by hand four generations ago. Some bogs that hold the cranberry's vines are close to 100 years old. Farmers used to use a wooden scoop to harvest when the vines were first planted. "If my father saw me doing this, he'd say I didn't know what I was doing and he's right. He's the only one on the farm that ever actually did it," says Haines of harvesting with a wooden scoop. "So, he's the only one that know what's supposed to be done." Murphy had to try it and was tired soon after. Cranberries are harvested when the berries are just the right red, but just because they're ripe, it doesn't mean they're sweet. Once the berries are ready, they are harvested through a method called "knockin' berries." It is like using a giant lawnmower underwater. The big wheels shake the berries loose but don't hurt the vines. 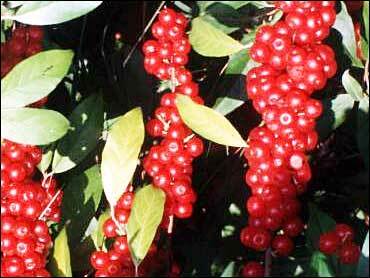 To gather the berries up, they pull a boom like the one used to contain oil spills. It becomes a virtual sea of berries. To get all those berries out of the water, you have to jump yet another ditch and brave the cold water again. And, you have to step easy in the water because there are small ditches in the ditches. Murphy's photographer found that fact out the hard way when he took an unexpected bath. Fortunately, Murphy was able to save the camera. Nobody batted an eye, as all kept working to get the cranberries onto the conveyor belt. Each truck carries a whopping 40,000 pounds of cranberries to the sorter. "When they come out of the bog, there's a lot of leaves and grass, so we have to pre-clean them before we deliver them to Ocean Spray," says Haines. Giant blowers whisk the debris and clean the berries. The leaves are sold for mulch. Finally, the clean berries are loaded onto 18-wheelers, headed to Ocean Spray and eventually will make it to dinner tables  maybe even yours.